Nature compels us all to move through life. We could not remain stationary however much we wished. Every right-thinking person wants not merely to move through life like a sound-producing, perambulating plant, but to develop – to improve – and to continue the development mentally to the close of physical life. This development can occur only through the improvement of the quality of individual thought and the ideals, actions and conditions that arise as a consequence. Hence a study of the creative processes of thought and how to apply them is of supreme importance to each one of us. This knowledge is the means whereby the evolution of human life on earth may be hastened and uplifted in the process. Humanity ardently seeks “The Truth” and explores every avenue to it. In this process it has produced a special literature, which ranges the whole gamut of thought from the trivial to the sublime – up from Divination, through all the Philosophies, to the final lofty Truth of “The Master Key”. The “Master Key” is here given to the world as a means of tapping the great Cosmic Intelligence and attracting from it that which corresponds to the ambitions, and aspirations of each reader. Every thing and institution we see around us, created by human agency, had first to exist as a thought in some human mind. Thought therefore is constructive. Human thought is the spiritual power of the cosmos operating through its creature man. “The Master Key” instructs the reader how to use that power, and use it both constructively and creatively. The things and conditions we desire to become realities we must first create in thought. 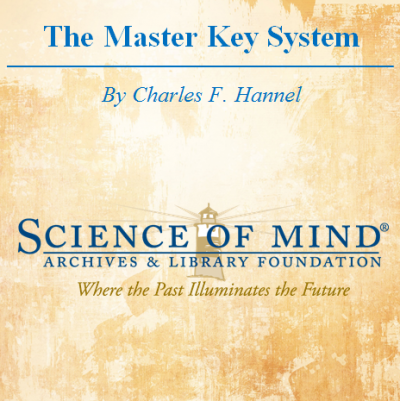 “The Master Key” explains and guides the process. “The Master Key” teaching has hitherto been published in the form of a Correspondence Course of 24 lessons, delivered to students one per week for 24 weeks. The reader, who now receives the whole 24 parts at one times, is warned not to attempt to read the book like a novel, but to treat it as a course of study and conscientiously to imbibe the meaning of each part – reading and re-reading one part only per week before proceeding to the next. Otherwise the later parts will tend to be misunderstood and the reader’s time and money will be wasted. Used as thus instructed “The Master Key” will make of the reader a greater, better personality, and equipped with a new power to achieve any worthy personal purpose and a new ability to enjoy life’s beauty and wonder.